It’s 3 years since Peebles featured on the blog here and 4 years since I highlighted signs in Peebles here. This was a coldish but sun-filled day and the autumnal colours were having their annual beauty contest in the trees by the river and on the river paths. 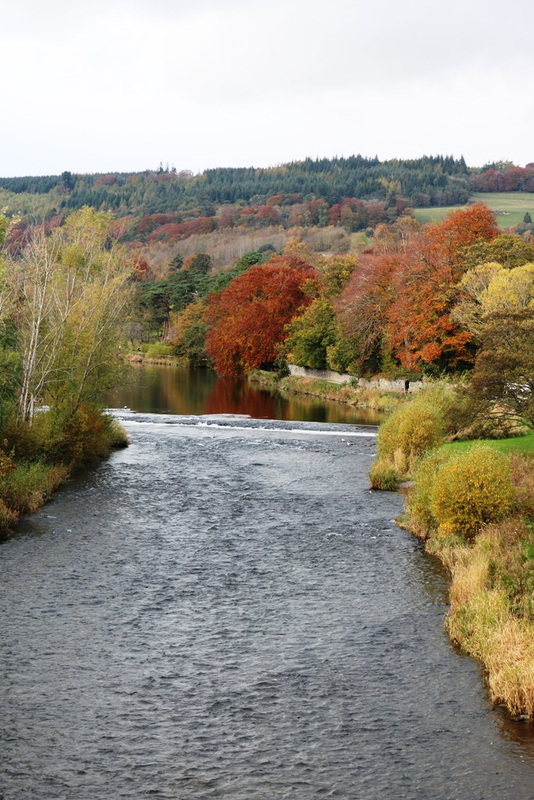 This is the view from the main road bridge in Peebles, looking along the river Tweed. The next photo is taken from the other side of this bridge and looks over the town centre towards the hills in the distance. The Leckie Memorial Church spire is prominent and there is a range of colours in the trees. What we did not know at this point, was that the colours seen from the bridge paled into insignificance compared to what we were about to experience. Our main purpose for the day was to visit Dawyck Gardens which is an offshoot of the Royal Botanic Garden Edinburgh (good photos). 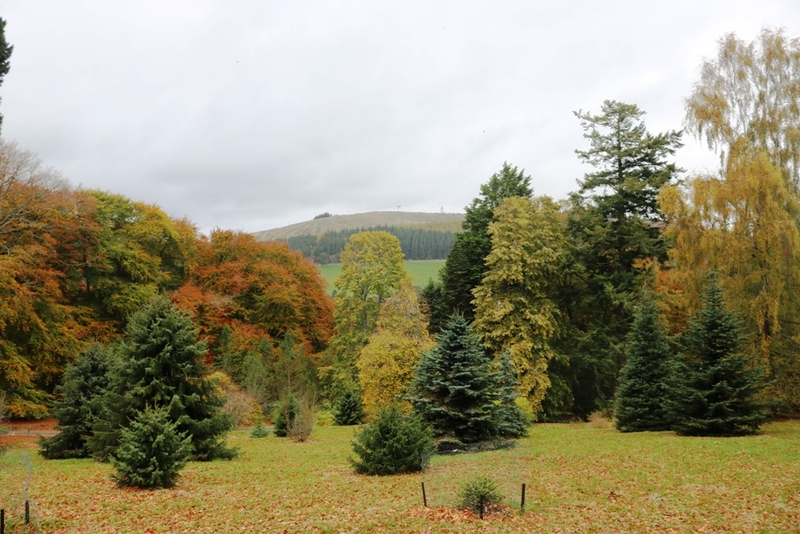 The name “gardens” is rather a misnomer for the Dawyck experience as it consists mainly of woodland, but this is extremely well nurtured woodland, with labels helping you to identify the many variety of trees. 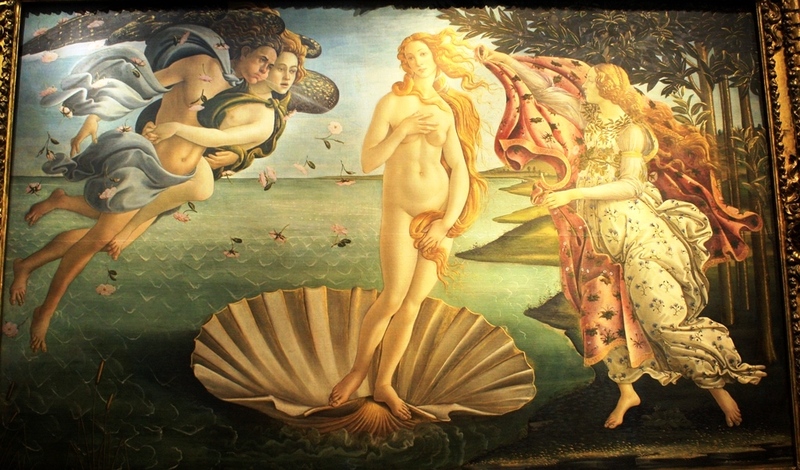 The site changes with the seasons, with swathes of snowdrops and daffodils in spring, and beautiful azaleas in summer. 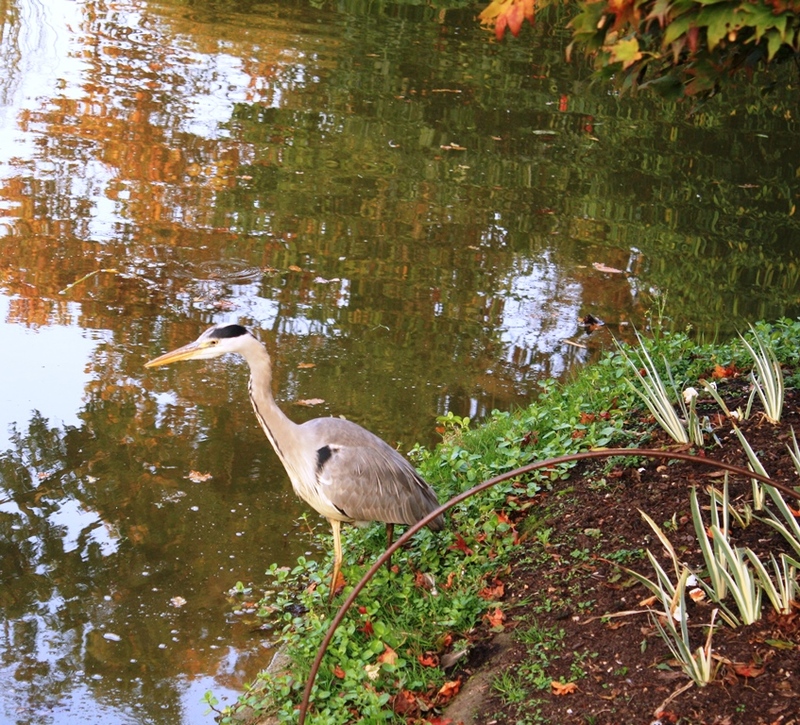 We were treated to the autumn spectacle. 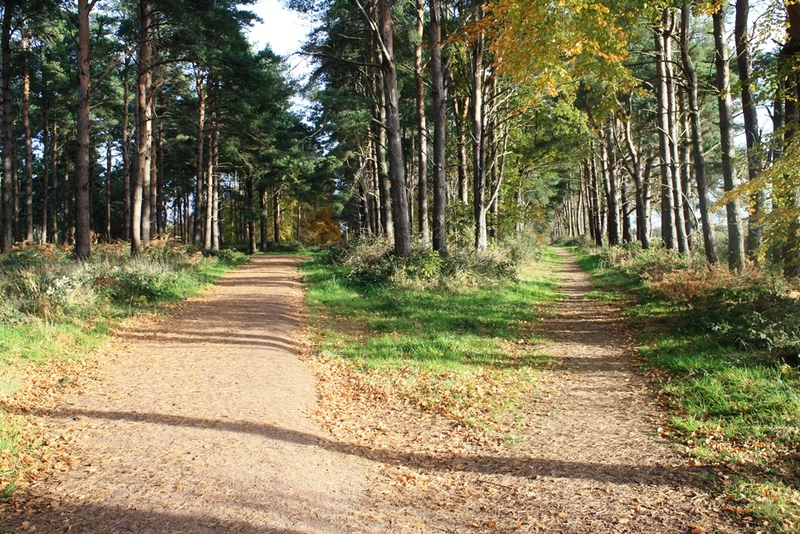 Having paid to enter at the well-stocked shop, you can follow a variety of paths through the woods. 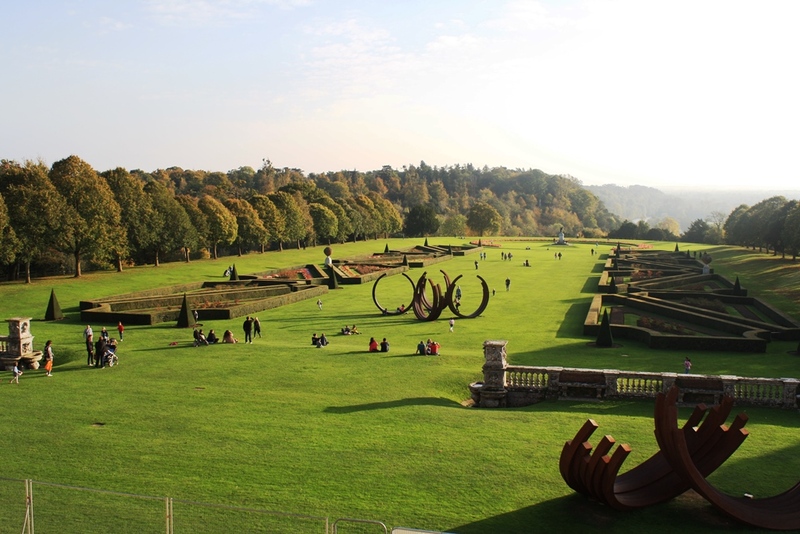 In addition to the splendour of the scenery, this is good exercise as you walk to the top of the gardens and through the different areas. 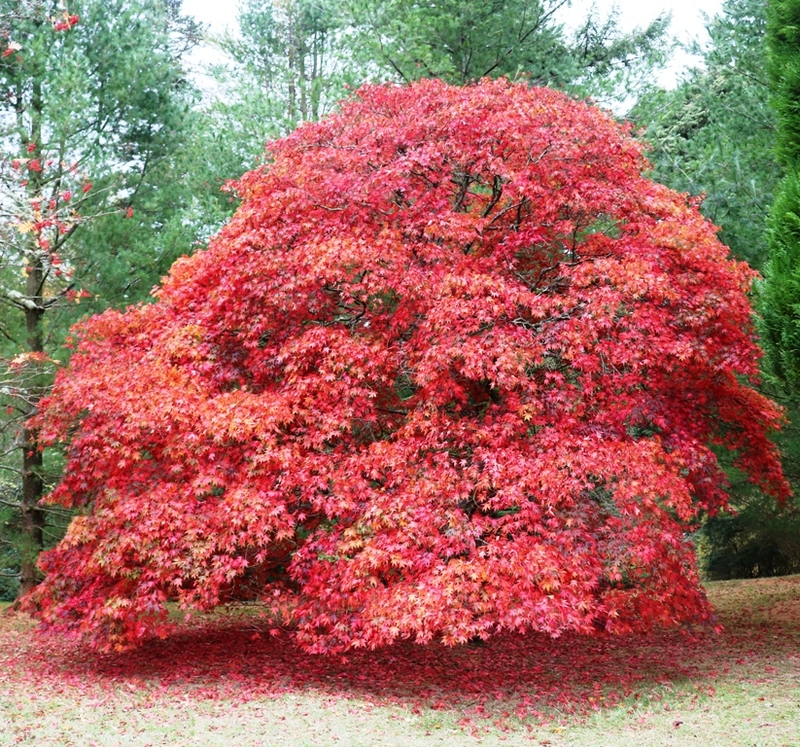 We were alerted to the domed acer (photo below) near the start of the walk and a stunning sight it is. The acer or Japanese maple is relatively common in the UK but we had never seen one as eye-catching as this sudden splash of deep pink in the midst of evergreens. It is also a very shapely tree. 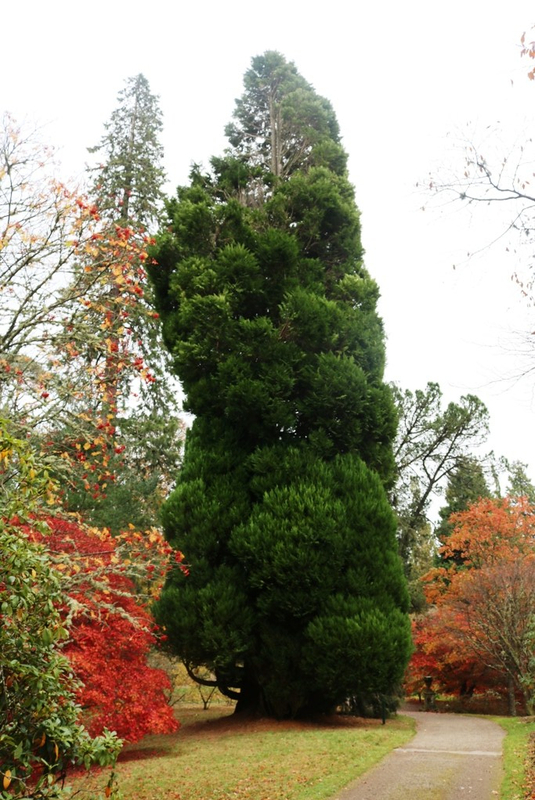 There is also a magnificent range of impressive Douglas Fir trees, named after the Scottish botanist David Douglas, and many of the trees here were grown from seed, whose descendants were brought to Scotland by David Douglas. 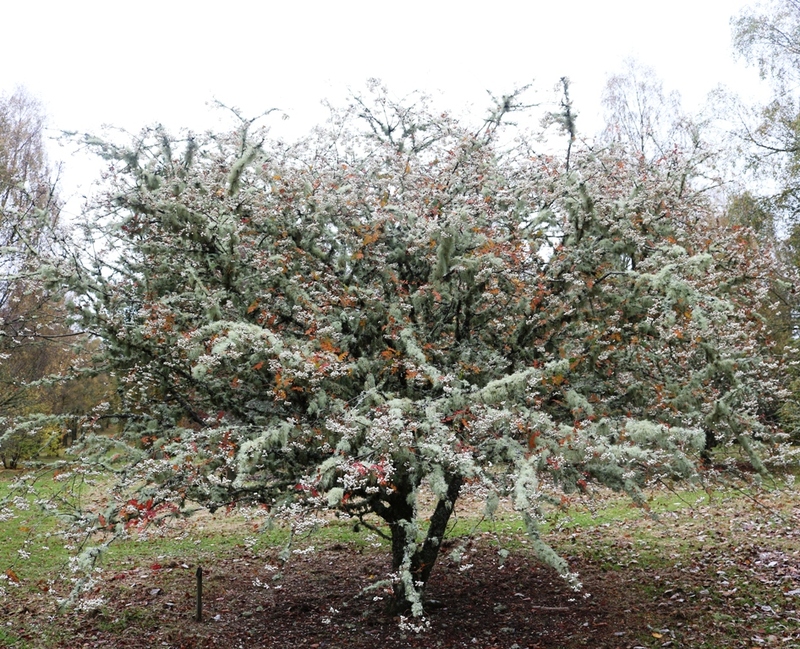 The one shown below is an excellent specimen and it is only when stand underneath one of these trees that you get to appreciate their height, solidity and what looks like bubbling growth. These trees dominate their surrounds and while the other trees may appear smaller, you appear very small indeed. There are a number of benches in the woods and taking a seat in one of the benches at the top of the forest, you are rewarded with stunning views. 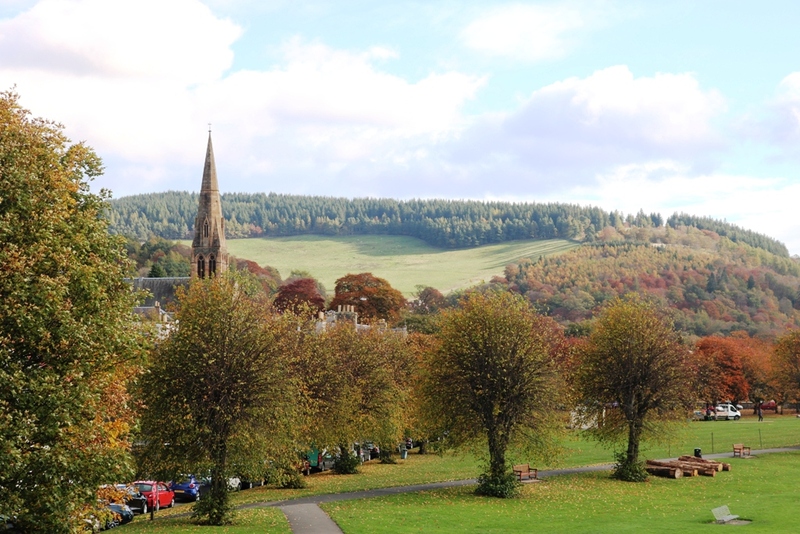 The photo below shows one such view, looking at a wide variety of trees and the hills above Peebles in the background. As your eye wanders across the scene, you go from the multi-coloured and multi-patterned deciduous trees to the larger and smaller fir trees, with the smaller ones making elegant green triangles on the leafy ground. You can sit for quite a while here and always catch something different as you survey this aesthetically pleasing landscape. 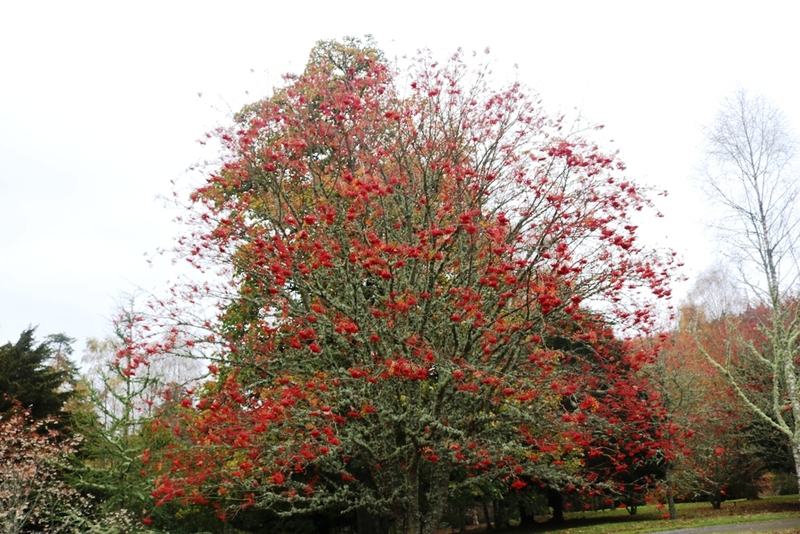 There is a huge variety of trees here and some are quite unusual, such as the sorbus munda below. What was fascinating about this tree was that, as you approached it, you feared for its survival because it was covered in lichen. However, another visitor with good knowledge of trees told us that the lichen was a sign of a very healthy sorbus munda, despite the fact that the lichen was making the attractive berries quite hard to see. In contrast, the sorbus commixta, a similar tree of Chinese origin, had little lichen and a beautiful display of berries as shown below. I took many more photos of the trees, the paths and the carpets of leaves – too many to show here. I leave you with a video of part of this wonderful forest, to which we shall return in the spring. We are off to Australia and New Zealand for 3 weeks in a few days time, so blog posts may be more intermittent than usual. On our trip to Dublin, we went by train to the bonnie seaside town of Dun Laoghaire (good photos). It was only 20 minutes on The Dart train and it is a very pleasant trip down the coast to Dun Laoghaire (pronounded Dun Leery), passing the famous Lansdsdowne Road rugby and football stadium, and the seaside towns of Blackrock and Salthill and Monkstown. Having arrived in Dun Laoghaire, we headed straight for the east pier which is 1.3K long and takes you out to the lighthouse. It’s a very enjoyable walk, with (photo below) the little yachts swaying gently in the swell as you make your way to the end. This is one of the town’s exercise spots as we passed, and were passed by, runners and speed walkers. There are also excellent views back to the town and out to sea when you reach the lighthouse, which still has some of the original military accommodation, such as the guard house on view. From the harbourside on the east pier, you look across to the west pier, which is almost as long. Looking back into town, one of the striking features is the relatively recent library building (photo below). As well as the library, there is a theatre, art gallery and cafe. The building is somewhat confusing for the first time visitor as it has several levels and different entrances/exits. Despite this it is a fine library, with much natural light and open spaces for study or relaxation. It is also an excellent addition to the architecture of the town, with the funnel like shapes on the top and the elegant use of glass at the end facing the sea. 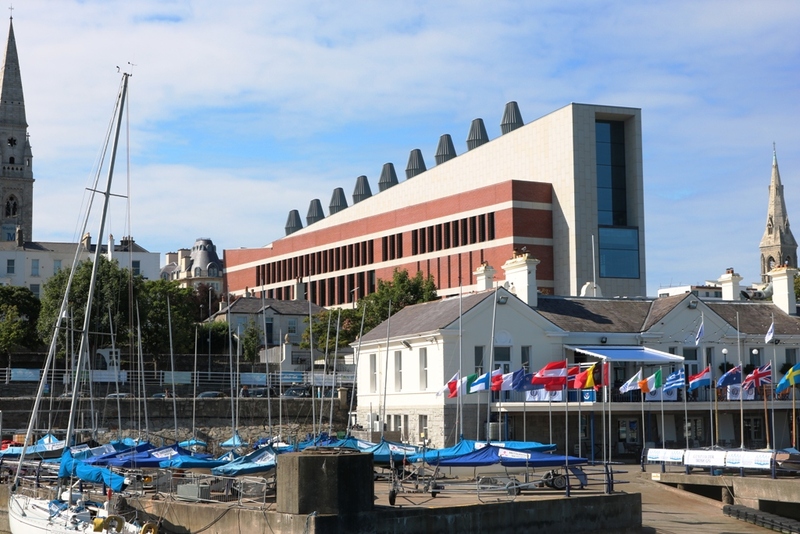 Library building from the harbourside in Dun Laoghaire. While in the town, we visited the National Maritime Museum which is housed in an old church and this adds to its attractiveness. 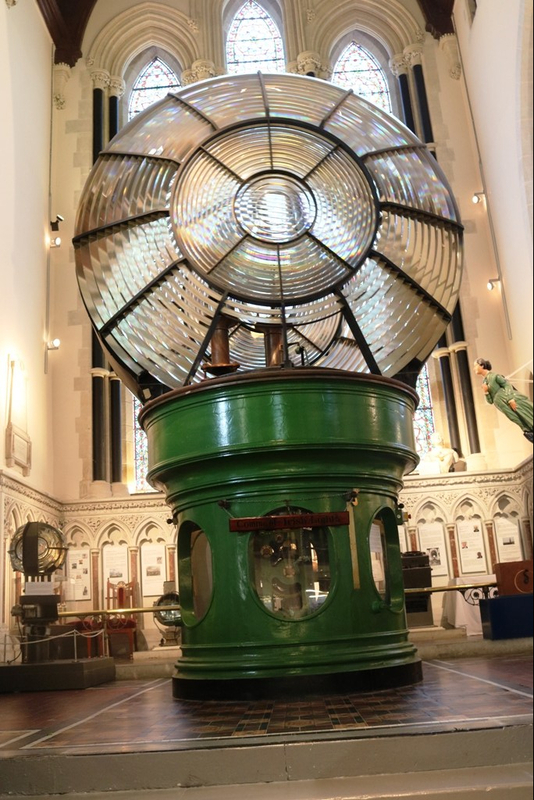 One of the museum’s most spectacular objects is the Baily Optic which is a huge light taken from the lighthouse in the seaside town of Howth. In the photo below, you can see how the light dominates that part of the museum, and how the natural light from the old church’s stained glass windows compliment the lighthouse optic. 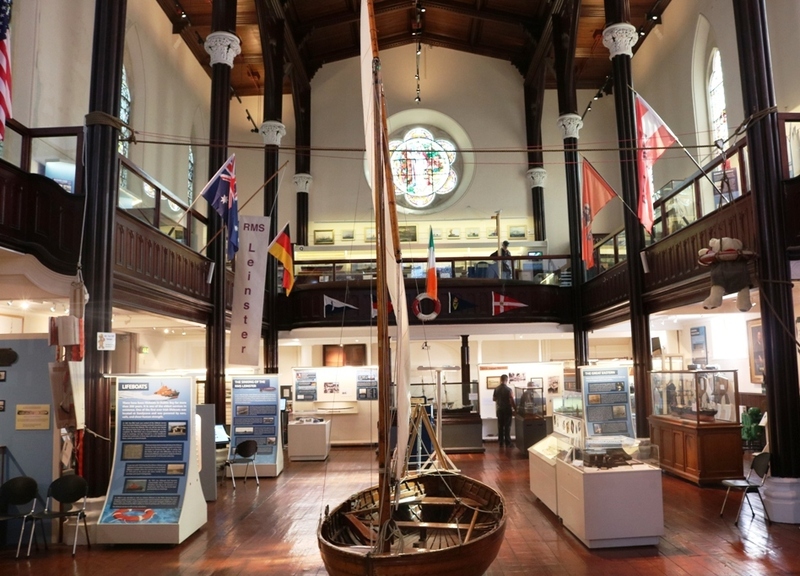 Looking across the museum (photo below), you can see a variety of collections which the building houses, including the Great Eastern ship, a section on submarines and a small section on The Titanic. 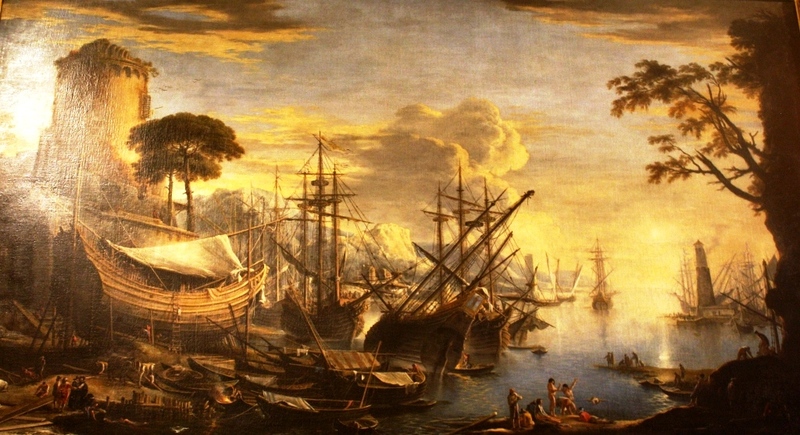 We learned much about ships over the centuries as well as aspects of navigation, and also the social aspects of travel by sea. Collections in the National Maritime Museum in Dun Laoghaire. 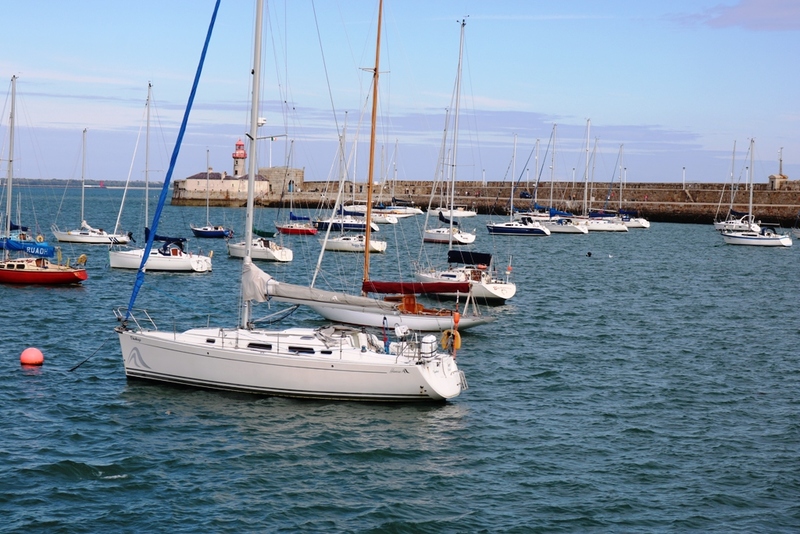 Dun Laoghaire is a busy town with a range of cafes, pubs and restaurants and there are a number of enjoyable walks in the town itself as well as by the sea. People of a certain age reading the heading of this blog post will immediately recall the wonderful Zombies’ track Time of the Season on their iconic LP Odessey and Oracle (note the deliberate misspelling of Odyssey). Here it is for you to luxuriate in. In my garden, just as most of the summer flowers are beginning to show signs of exhaustion, having bloomed vigorously for 3 months, the gladioli now come into their own and stand imperiously above the rest. My gladioli are the Burj Khalifa of the flowers, towering over the others and they have been particularly tall and colourful this year. The first photo shows a purple example, the delicate folds of the flower protecting the scorpion-like stigma, the pollen holder. I also like the shadows on the sun-touched petals and the emerging flowers above. The next photo is of a more showy gladiolus, vigorously projecting its multiple shades on to the viewer. This flower could be a filmstrip of the colourful dresses worn by the can-can dancers of the folies Bergere. The stigma are more pronounced here and resemble a bee’s antennae. 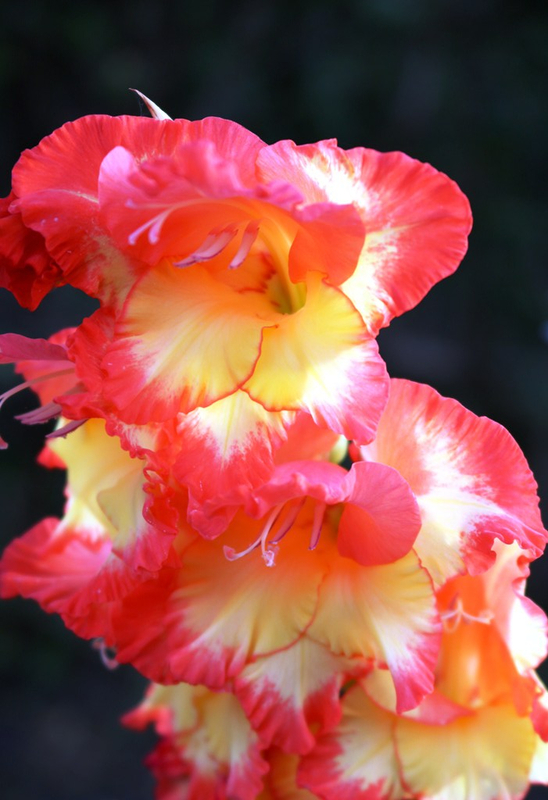 The delicacy of the colours on this gladiolus make it very attractive to the eye. We recently had an extremely stormy day, with gusts reaching up to 60mph at times. During the day, there was a tremendous rainstorm and the wind temporarily eased. This prompted the appearance of a rainbow over the sea and Dunbar harbour, and I managed to catch the rainbow behind the gladioli, which we have staked up securely against the wind. 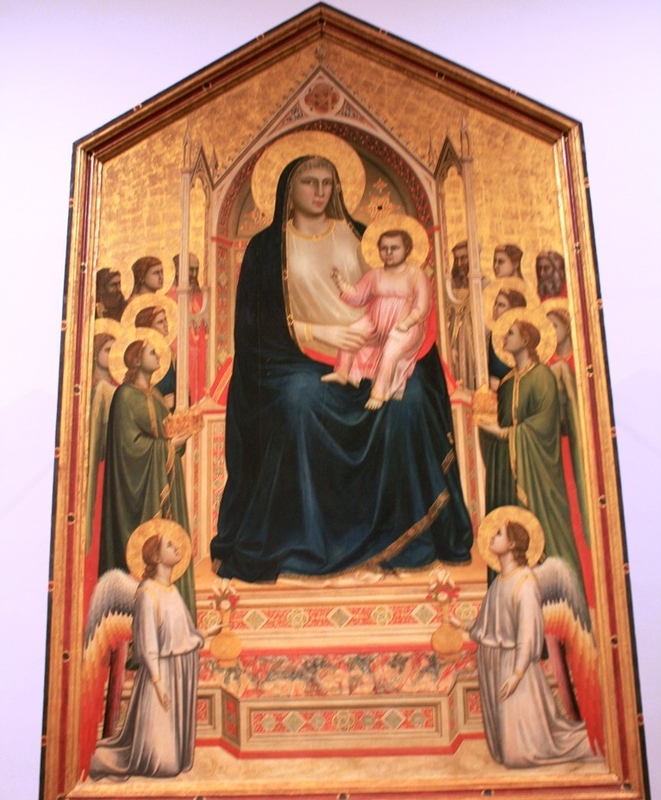 Back to normal after a very successful trip to Pisa and Florence, of which more later. There’s an old Scottish saying relating to being on holiday and returning to the usual routine – “It’s back tae auld claes and parritich” i.e. back to old clothes and porridge. It’s not cold enough yet for me to have porridge in the morning but a new pot of soup is welcome all the year round. 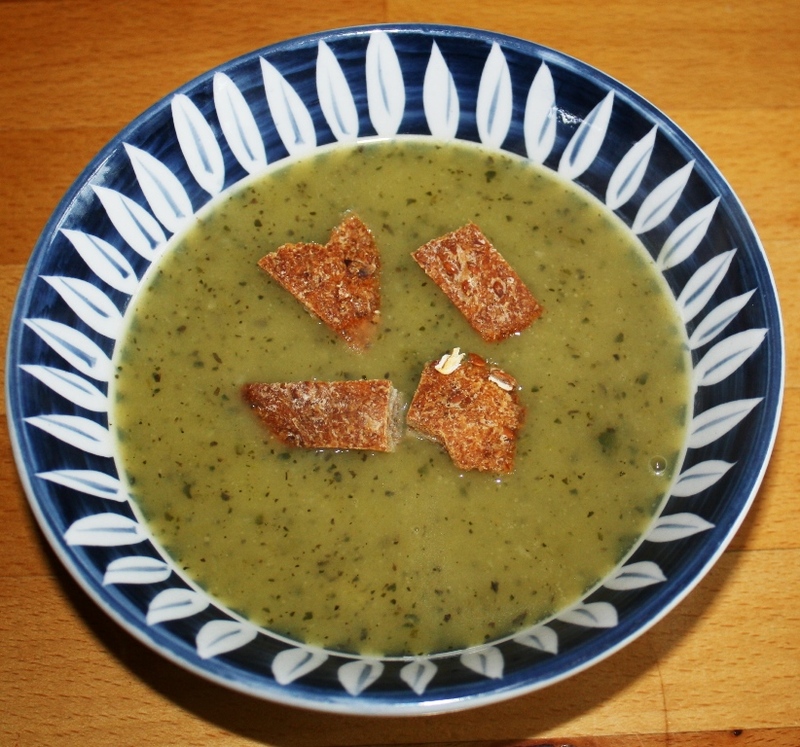 Today, I was making courgette, and basil soup. It’s fairly straightforward with the following ingredients: 1 medium leek, 4 good sized courgettes, one large potato and dried basil. Now I know that a good many people who read this blog will call courgettes zucchinis. This source claims that there are differences between the two e.g. that courgettes are smaller than zucchinis, but I think that the only real difference is in where the terms are used – courgette in France, the UK and (so the website claims) South Africa and New Zealand; zucchini in Australia and North America. I’m not sure about New Zealand, so a comment on that would be good. 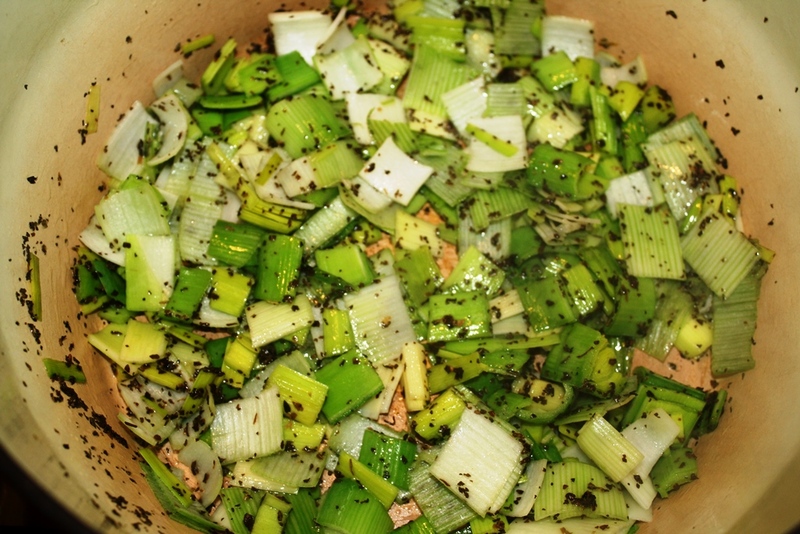 To start, sweat your chopped leek in a little oil, to which you have already added the dried basil – amount according to taste. In your solid soup pan, it should look like this i.e. a thing of beauty that might be submitted for the Turner Prize as a work of contemporary art, signifying the integration of human thoughts and deeds across the newly green world. On the other hand, it’s still a thing of beauty but a photo of leeks. I never use a processor to chop my vegetables. There is something calming about washing your leek, cutting it into 3 and then slicing it up, although this obviously has overtones of violence. Add the chopped courgette and, magically, you have another potential submission to the prize, representing …mmm you tell me. It now looks and smells very good. 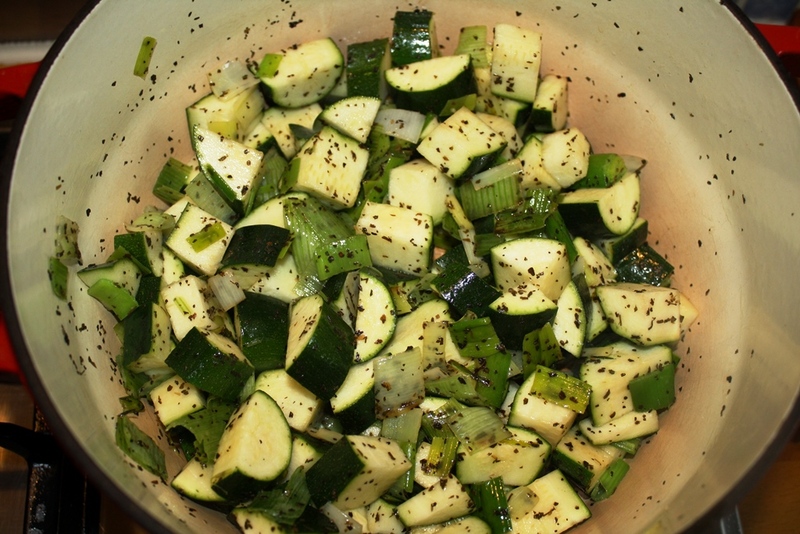 Chopped courgettes and leeks in basil and oil. To this, you add the peeled and chopped potato and one litre of the stock of your choice – I used chicken stock cubes. Simmer for about 20 min and take off the heat. I then mashed it down with a potato masher and then liquidised it with my hand-held blender, one of the best kitchen implements in which I have ever invested. Here is one serving of the soup, with the chopped end of a 70% wholemeal loaf from Dunbar Community Bakery. This raises another philosophical issue – what do you call the last slice in a loaf of bread? My wife would say heel, while in my family when I was growing up, it was always called the outsider. A relative called it the Tommy – rhyming slang for Tommy Steele perhaps? What did your family call the last slice? Another Turner Prize entrant – the four islands in the speckled green sea: the post-nuclear world. Discuss. 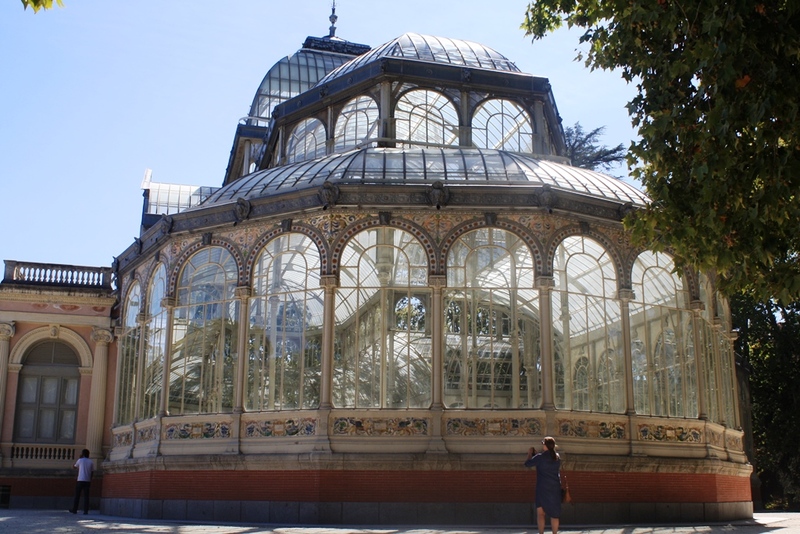 For the final posting on Madrid, I swithered between the magnificence of Madrid’s cathedral – especially the internal colours – and the Crystal Palace in El Retiro Park, featured here recently . Having been out cycling this morning in the cool, fresh air and enjoying the autumnal spectacle of the countryside at the moment, I chose the latter. 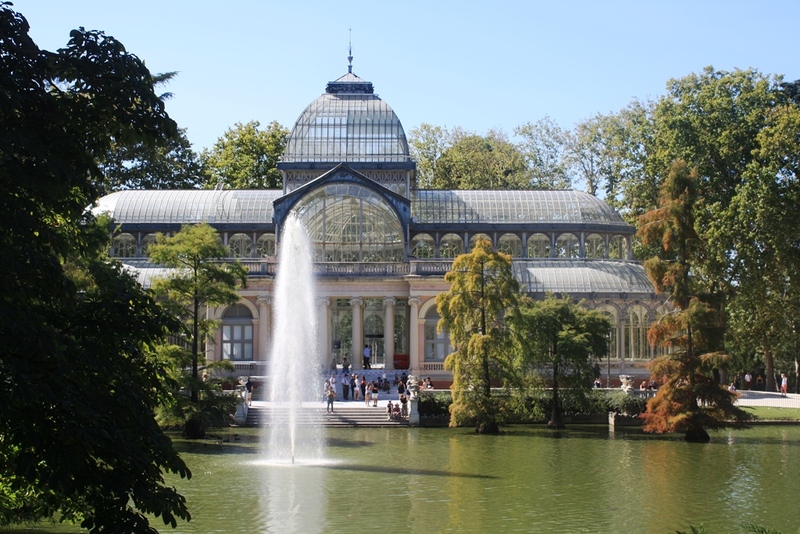 While walking through the large park, it’s easy to miss the sign to the Crystal Palace or Palacio de Cristal, to give it its proper name. Once you see not only the palace itself but the setting, you cannot be unimpressed. 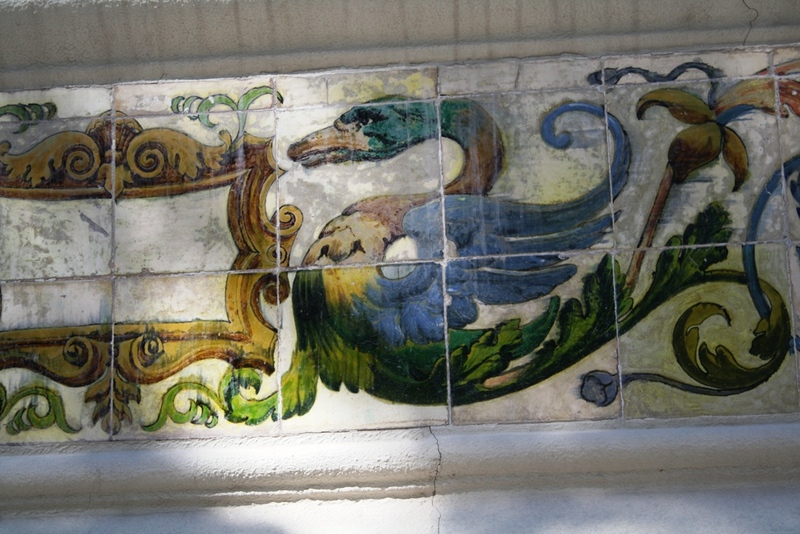 The first photo shows what you see approaching the palace – a light filled building on 3 levels, with beautiful arches over the windows and ornate decoration around the bottom, a close-up of which is shown in the 2nd photo – here is a swan – like, mythical bird, with no feet and a tail of flowers. 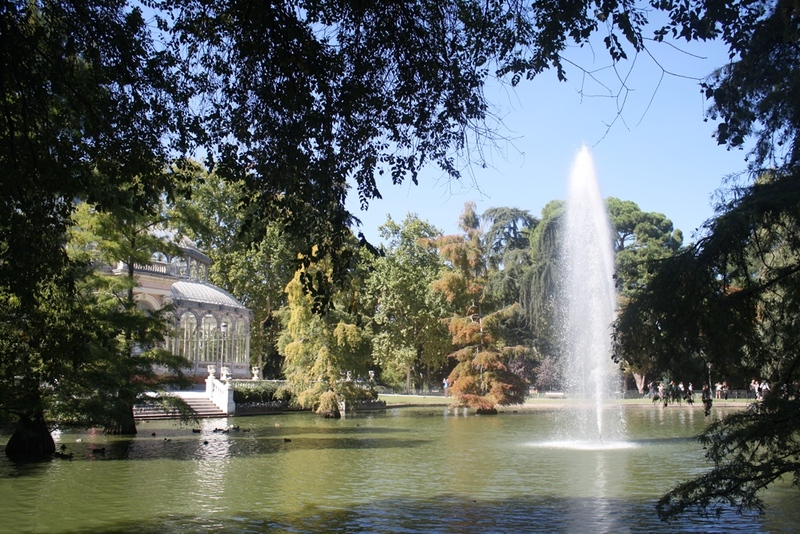 Once you pass the entrance to the palace, which has been closed for a long time for internal redecoration, you can walk around the large pond, with its fountain. 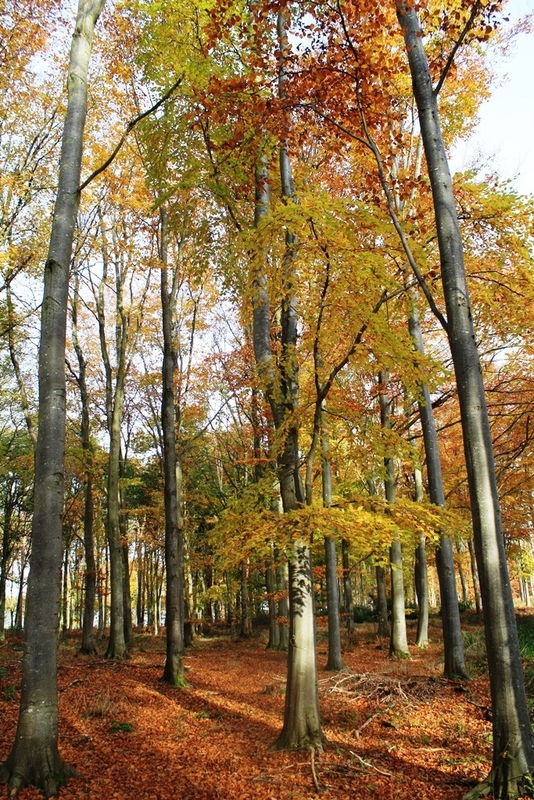 You pass the tall, thick-trunked trees whose leaves differed in colour, from light green to dark green to reddish-brown. You can then see across the pond to the palace. 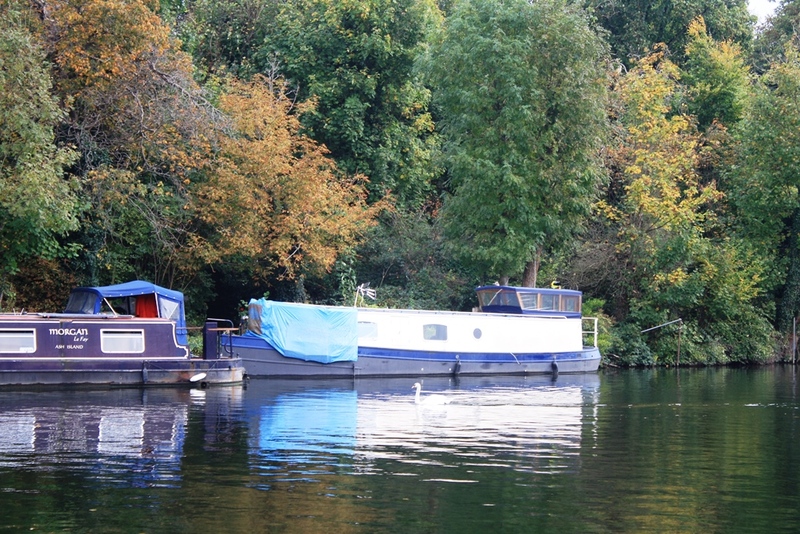 It’s a very peaceful place, made even more pleasant by the late September sunshine and 25 degrees. The final 2 photos show the palace from the side of the pond and from the opposite side of the pond to the palace. This is a slice of remote countryside which has been picked up and placed near the centre of one of Europe’s busiest cities. The Madrilenos are lucky to have it. I’ve just finished reading one of the best books I’ve read in a good while. Colson Whitehead is a new author to me but on the basis of this book, I’ll be trying more. 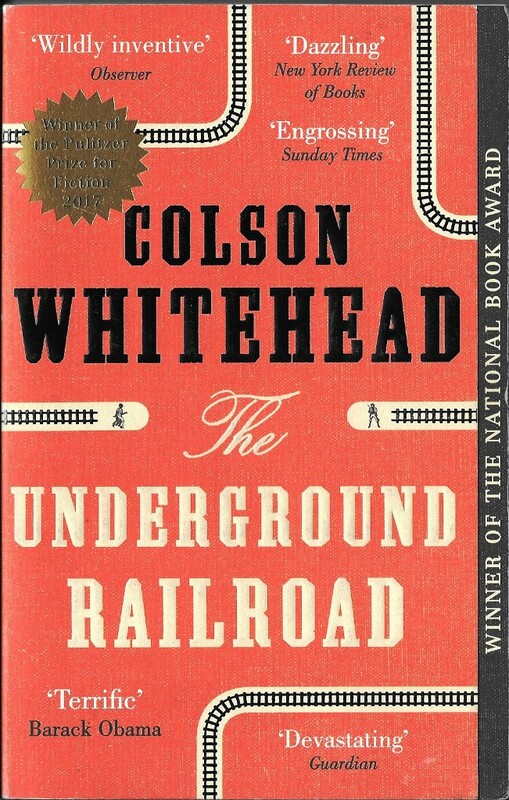 The Underground Railroad has won many awards, including the famous Pulitzer Prize for Fiction. The novel begins on a slave plantation in Georgia with one particularly sadistic brother in charge. The heroine Cora knows that her mother escaped the plantation and abandoned her as a child. Cora has no intention of trying to escape but is persuaded to do so by Caesar. The horrors of slave life – constant hard work, poor conditions and regular beatings – are well described in a series of incidents. Whitehead is an excellent storyteller but, as the Guardian reviewer points out, other novels have covered this ground. What makes this novel unique – and this is no spoiler – is that the author takes the well known escape routes for slaves, known as the underground railroad and transforms it from a series of safe houses into an actual underground railroad, with tracks, stations and locomotives . So we are asked to follow the author’s leap of imagination and this is not difficult as Whitehead is such an accomplished writer. The novel then focuses on both those who seek to help Cora, liberal whites as well as former slaves, and on those who wish to capture Cora and take her back to the plantation. The slave catcher Ridgeway is a key character in the novel and Whitehead manages not to demonise him, despite his gruesome occupation. Ridgeway views the world in an uncomplicated manner “It is what it is” he says e.g. slavery exists and different people make money from it. The novel ends on a hopeful note although the reader does feel that there is no guarantee about Cora’s future. 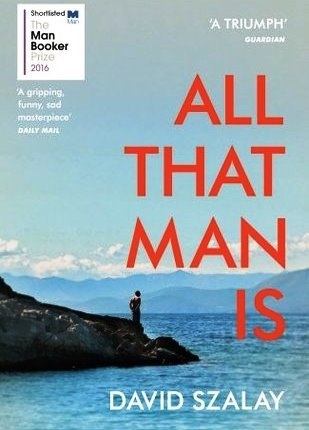 This is a novel which is harrowing at times, but you are driven along by Whitehead’s excellent narrative which often has you on the edge of your seat. The Underground Railroad is a passionate and imaginative novel so go out and buy it immediately. You can hear/download an interesting interview with the author here (left hand column). 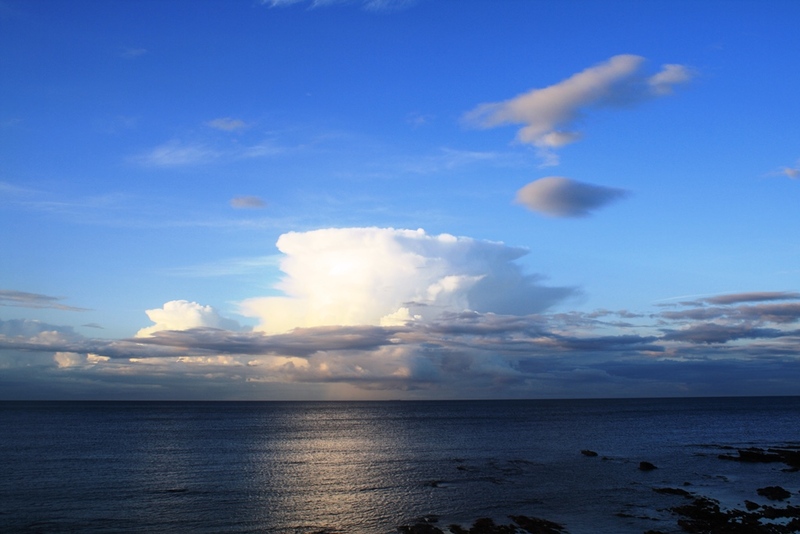 At the end of summer, we often get changeable weather and this is accompanied by a variety of cloud formations in the evening. Last week, looking out from the back of our house, we noticed an interesting light on the sea. Normally, it is when the moon is full and over the sea, or the setting sun casts its light. On both occasions, there is what appears to be a silver (moon) or a golden (sun) pathway across the water, as in the photo below. In this photo however, the sun was not yet setting and this view looks north, with the sun at this point in the west. So, first the light, then the cloud formation itself in the photo below. 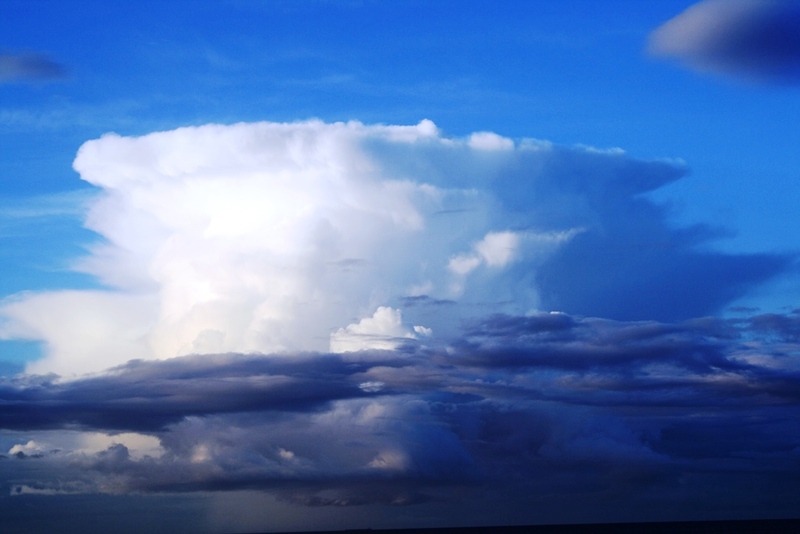 This appears to be a nuclear explosion or a volcanic eruption in the sky, and the many shades of blue on display was impressive. There’s a white castle in the middle and monster racing dolphins underneath. Otherwise, it’s a piece of abstract art representing the chaos in the world now, or what the end of our known world (or its beginning) might look like. That’s what I saw, what do you see? 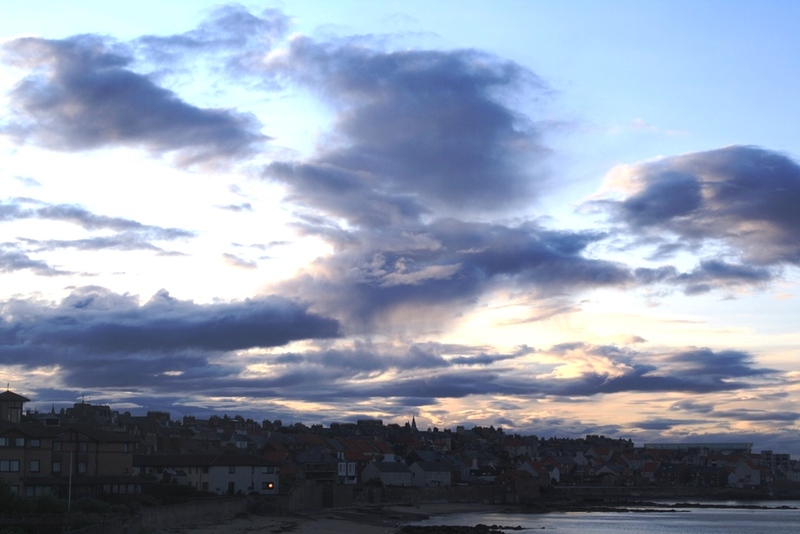 Turning my attention west to the town of Dunbar itself, there was also an interesting formation of clouds above the town, in the photo below. Here, the clouds are in more anarchic mood, splitting up and diving off in different directions. It was one of these evening when you looked at the clouds, turned round to look north, and when you turned back the shapes had changed, as had the colours. A wonderful sight. 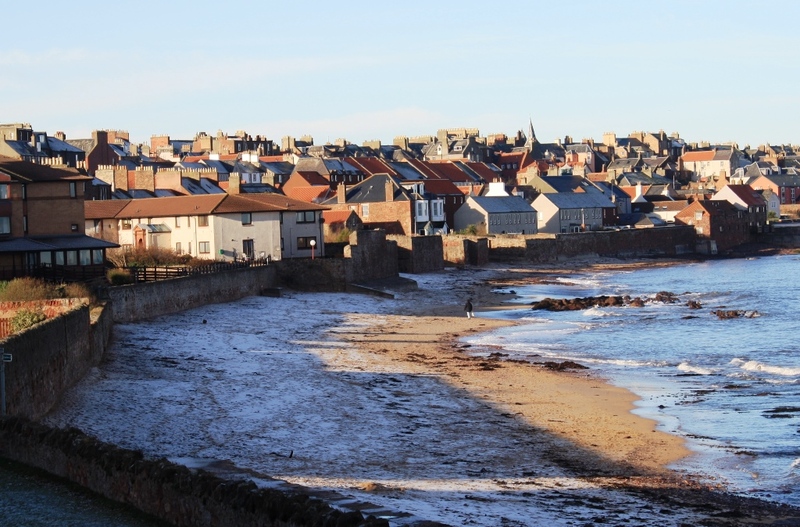 Last week, we had a series of very frosty days in Dunbar. 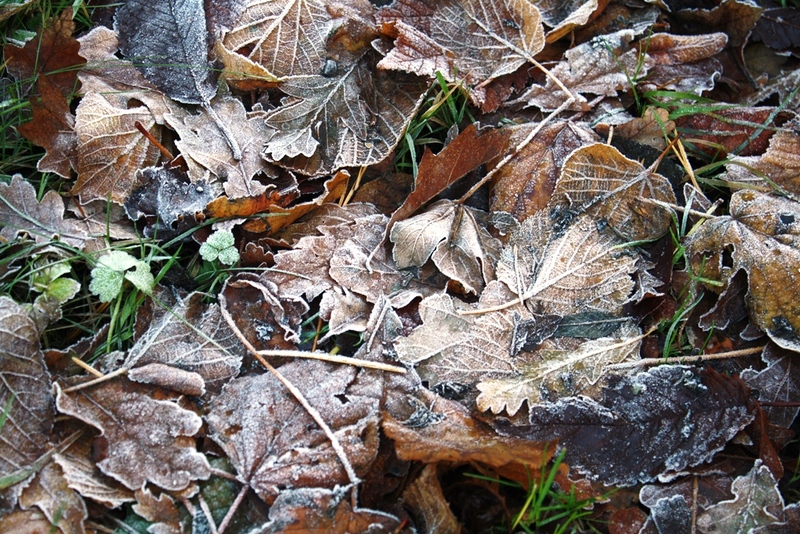 When you get frosts in November, there are always gloom merchants around who see this as a sign of a bad winter to come. Likewise, if you get a comparatively warm day in November, there will always be someone in the street saying “Aye, we’ll peye (pay) for this!”. This view of life of course, sees the world in simplistic terms, for every gain ( a sunny day), there will be pain ( a frosty day). We optimists argue that you should enjoy both sunny and frosty days – if you can. I was out cycling last week on 2 of the frosty days and I took my camera on the second one. Unlike last week, both these cycle rides were very enjoyable – sunny days, with big Australian clear blue skies, on my mountain bike and hitting the occasional thick patches of ice en route in the countryside. The thick tyres on this bike mean that you can crunch through icy puddles on the road. The key thing is never to touch your brakes on the ice, as you inevitably end up lying on the said ice and looking up to the big sky, and feeling an ever-growing pain in your knee. I stopped the bike at Pitcox Farm, of which more later. 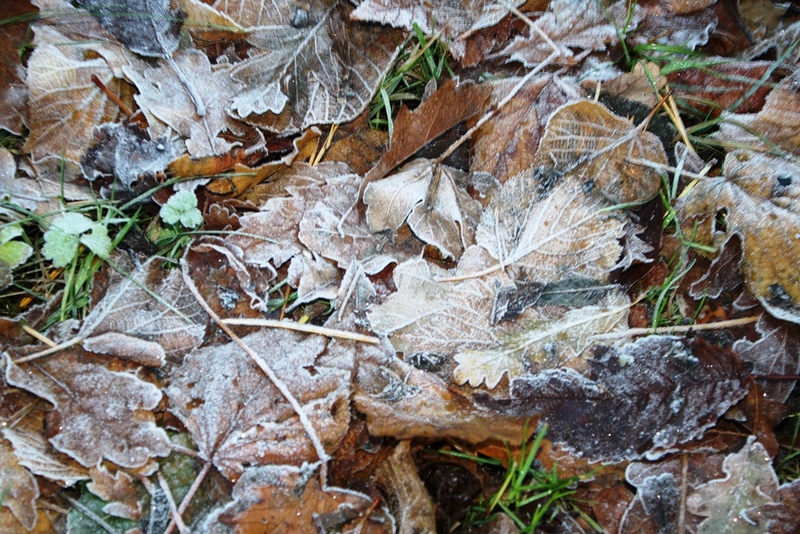 On the roadside, the fallen leaves had been highlighted by the 3 days of frost. I took these close up photos and looking at them when enlarged, I’m sure we may see different things. What do I see? What strikes me most are the patterns on the leaves, some like splayed fingers, others like branch lines of a metro system, some like a child’s drawing of a tree and others like protruding veins, which are white, unlike their varicose counterparts. There are also twigs, leading your eye from line to line. Back home, I went out to the back of the house to catch the thick frost on the beach. There looks like a confrontation in the photo below. The frost has marched out from the stone wall towards the incoming tide and the two armies are separated by the Independent Republic of Sand, upon which the sun shines. The tide receded, the frost stayed put and then it was completely annihilated by the invisible Thaw. The following day, there was high tide and the jubilant sea laughed its way up to the wall. There’s a lovely image in Amy Lowell’s poem The Hoar Frost, with these lines: “And when I came into my garden,/My silken outer-garment/ Trailed over withered leaves”. Back to Pitcox Farm, which usually makes an appearance here in late January, early February when the first snowdrops for miles around can be seen. The farm, with its impressive house and farm cottages is 4.5 miles (7.2K) from Dunbar and you get there on quiet country roads. 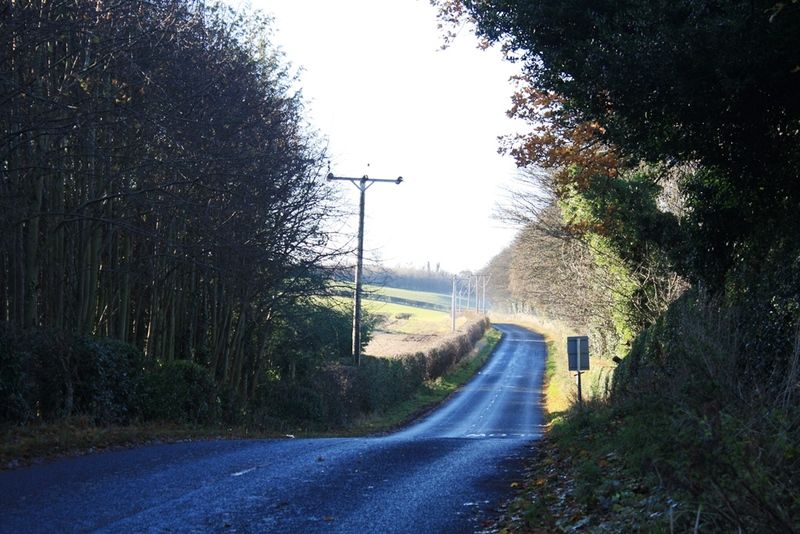 I was on my way back when I took the photos here – of where I’d come from and the road down to the cross roads. 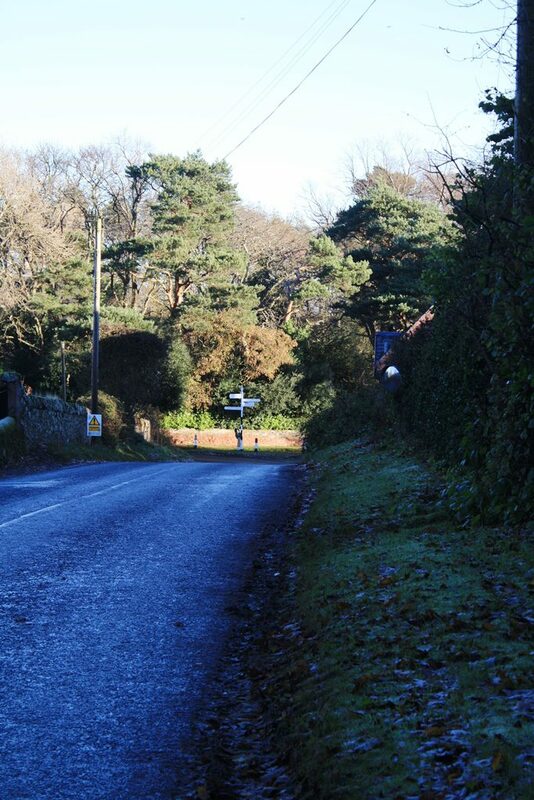 At the place in the photo above, the roadside was frost-filled, the leaves static, the air cold and my breath steamy. 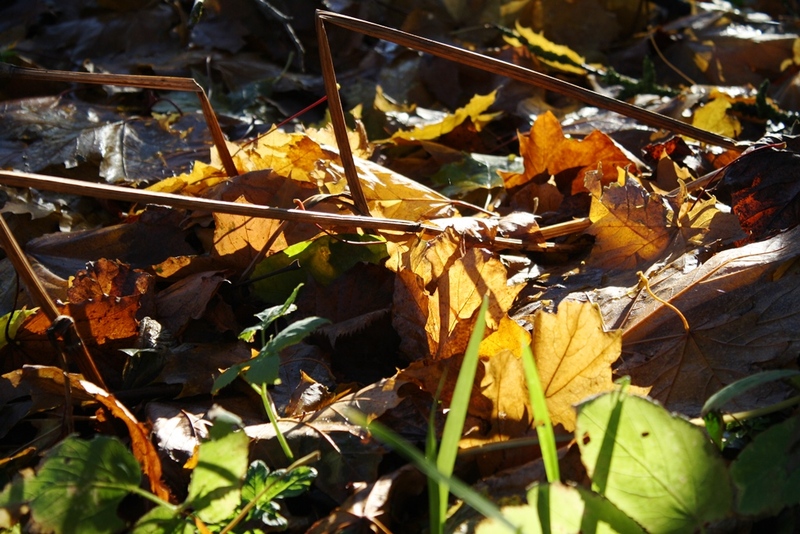 At the bottom of the road, just past the crossroads sign, the sun was out and the frost had been banished, with the leaves enjoying the temporary heat, as in this photo, which appears to contain unknown stick insects. There were also magnificent shadows cast by the now leafless trees in the garden of Pitcox House. In this photo, the shadows look animated as if engaged in mid morning tree shadow aerobics and the trees themselves stretch out as far as they can. When I came back from my cycle this morning, having passed a field of frozen sprout plants standing motionless in the field, their now yellow lower leaves stuck to the ground, and also having gone past an exquisitely coloured avenue of trees and roadside leaves at Bowerhouse (local pronunciation Boorhoose), my intention was to add to my photos of late autumn trees and early frosts here. This plan was thwarted as the wind from the east got up and the rain arrived, meaning leaden skies and rising temperatures. 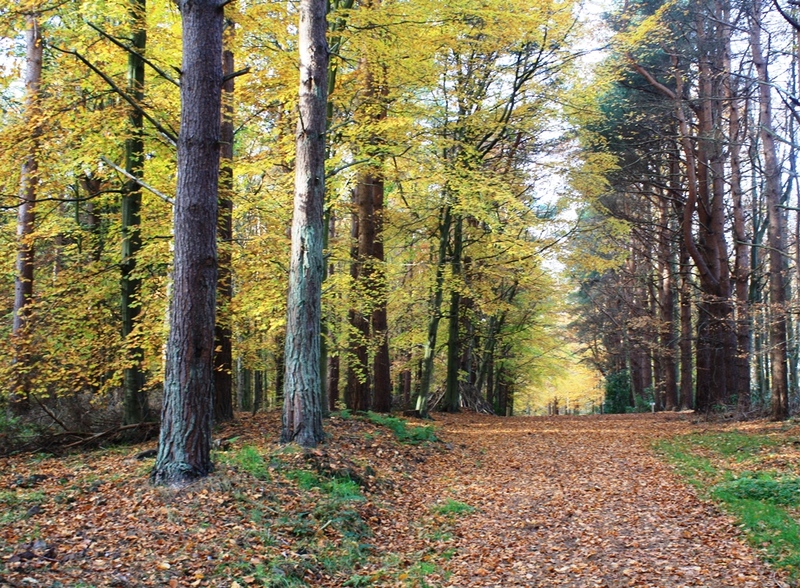 A walk last week through Lochend Woods in Dunbar (about 1K from our house) was particularly enjoyable because of the variety of colours in the trees and on the floor of the woods – a hundred shades of yellow, brown and green. So I went back with my camera. 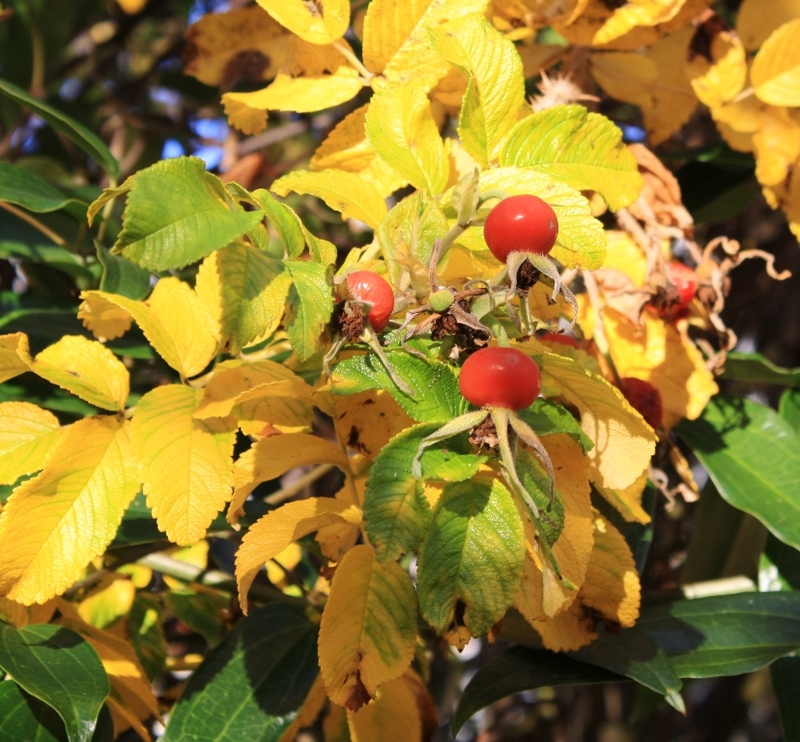 The first photo is of rose hips. I have now learned that you can make rose hip syrup although it looks like it might be too sweet for me. Also, rose hips can be cultivated from sophisticated garden roses and not just the dog roses you get in the wild. I like the contrast between the bright red of the hips and the leaves, which are in various stages of maturity i.e. from green to pale yellow. The next photo takes in a range of trees. 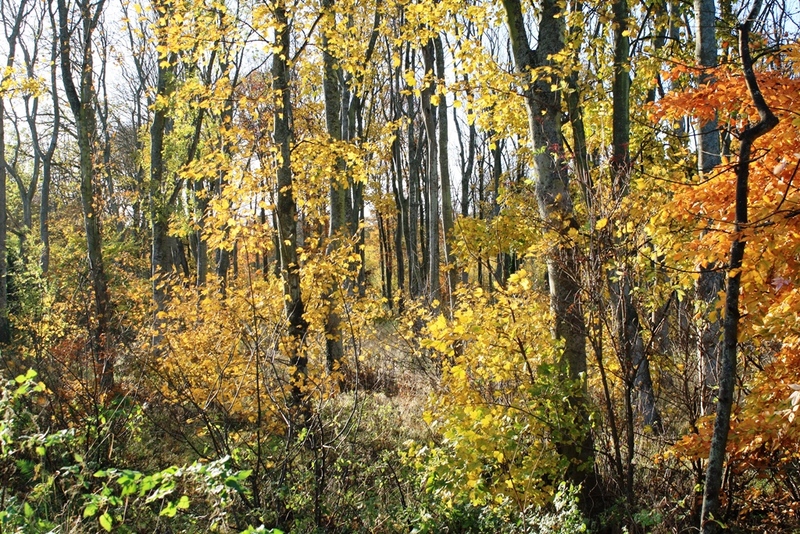 In this photo, I like the way the leaves contrast with the dark trunks of the trees. The erect trunks draw your eye up and down the photo and when you look closer, many of the trunks are not straight but bent at various angles, and they are of various girths. 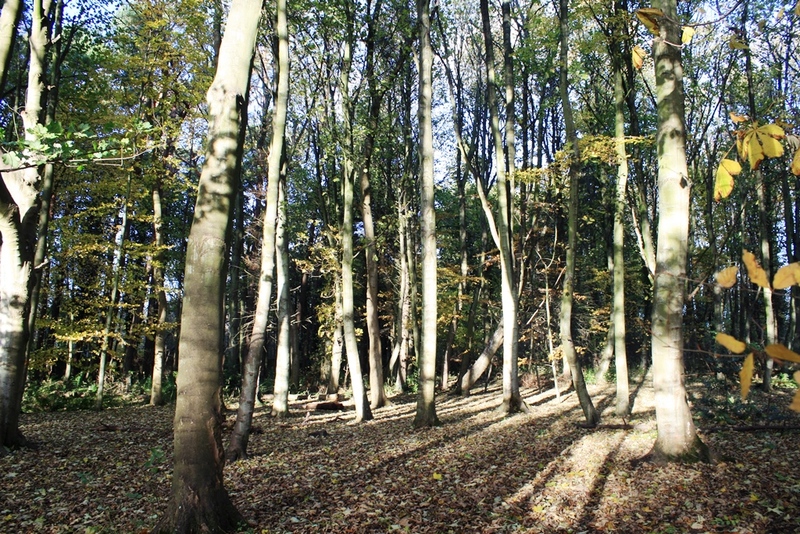 The sun on the woods here actually makes some of the trunks look darker than they are. Contrast this photo with the one above. In this photo, the sunlight is making the tree trunks lighter and the trees take on the look of gum trees in Australia. This photo is deceiving as you might think that it was taken on a very hot day if you only look at the shining trees. I also like the shadows on the ground which are extensions of the trees and often lead your eye from one tree to another. I also liked this photo. 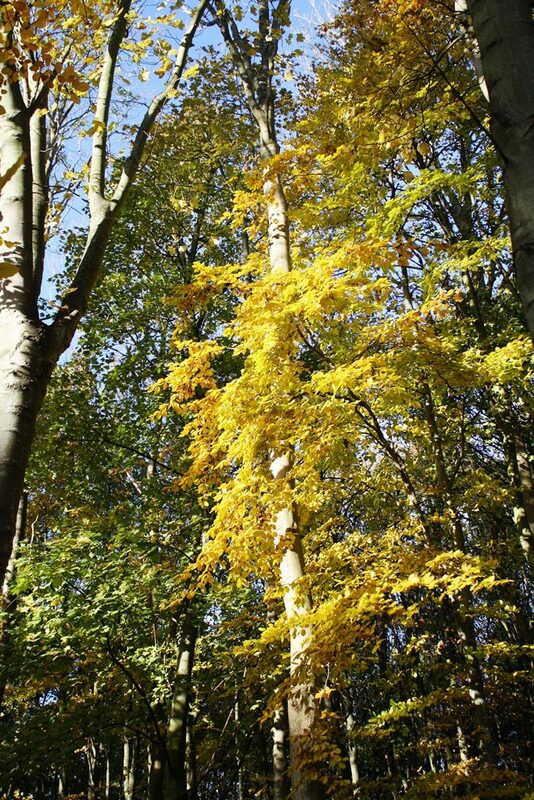 Firstly, there is the startling colour of the yellow leaves, made paler by the sun and they show off the smooth tree trunk behind. Secondly, there is the real sense of height and I think the photo makes these trees look taller than they actually are. There are many lines to follow in this photo – up, down, to the right and left and back again. 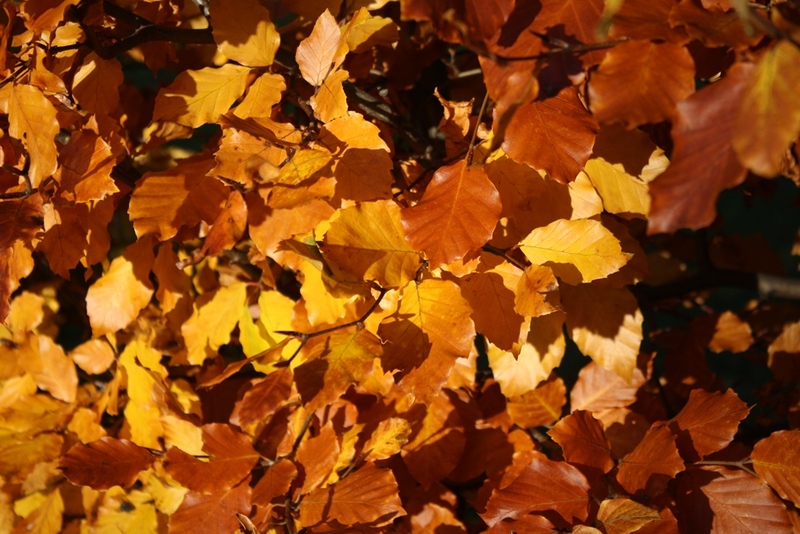 On the way home, at a house on the edge of the woods, I passed this copper beech hedge, shown in close-up below. This is purely accidental on my part but when I look at this photo, I have the impression that the leaves are in motion and are falling although they are not. Also, the shadows of the leaves appear to increase the number of leaves on show. The colours and leaf patterns are fascinating the more you look. So to cycling, at least last Friday’s cycle. There are some days you go on a bike and no matter how flat the road or how light the wind, it’s a struggle. It was a very cold but bright morning and I was well rugged up in my winter gear. One thing about late Autumn/winter cycling is that it takes a long time to get ready. In the summer, on go the shorts and top and shoes and helmet and half finger covered gloves – and off you go. At this time of year, it’s top and shorts and leggings and another top and a jacket and head cover like a monk’s cowl and a buff and a helmet and shoes and overshoes, which are tight and hard to get on. 5 minutes later – off you go. I was about a mile into the bike ride on Friday and started to feel my legs heavy and my back sore. Now, in these situations, to what extent your legs and back are actually sore is open to question. What happens is that your mind takes over. Then there’s the good angel and the bad angel. The bad angel says “Well, you were going for 20 miles (32.4K) but, hey if you turn at 6 miles, who’s going to know?”. The good angel says “Who will know? YOU will know! Are you a man or a mouse? Forget 6 miles pal, 10 is the turning point – if not further”. The nearer I get to the 6 mile mark, the voices get louder. Which one will win? I nearly turn at the roundabout at 6 miles but keep going and – this always happens – once I’m on my way, my legs are lighter and my back is not sore. What you need to do when cycling on these kind of days is to detach your mind from your body and just let your legs take over. On these days, there much more sense in your legs than in your weak and complaining brain. The Clematis and the Bee; St Armand Canal Paper and Cornflower seeds; and The Patient Who Had No Insides. Before checking my email this morning, I turn the page on my poetry calendar – still the one from 2013 as there appears to be no replacement. One day (next life?) I will do my own poetry calendar which will probably have to be online, but don’t hold your breath. Today’s poem is called The Search by Eamon Grennan and it begins “It’s the sheer tenacity of the clematis clinging to/ rusty wire and chipped wood-fence that puts this/ sky-blue flare and purple fire in its petals”. It’s an interesting concept that “tenacity” rather than natural growth is what makes the clematis grow. The poet praises the plant for “lasting and coming back” despite the autumn weather. There’s another poetic observation “.. the way the late bee lands/ on its dazzle, walks the circumference of every petal” before “.. drinking/ the last of its sapphire wine”. You can easily envisage the bee as it skirts the petals before feeding on the “sapphire wine” – a startling combination of words. Next time you see a clematis, think about its tenacity. An enchanting birthday present last month from my sister in law and brother in law. They had visited Gilbert White’s Garden in Selbourne, Hampshire and brought me 2 presents. 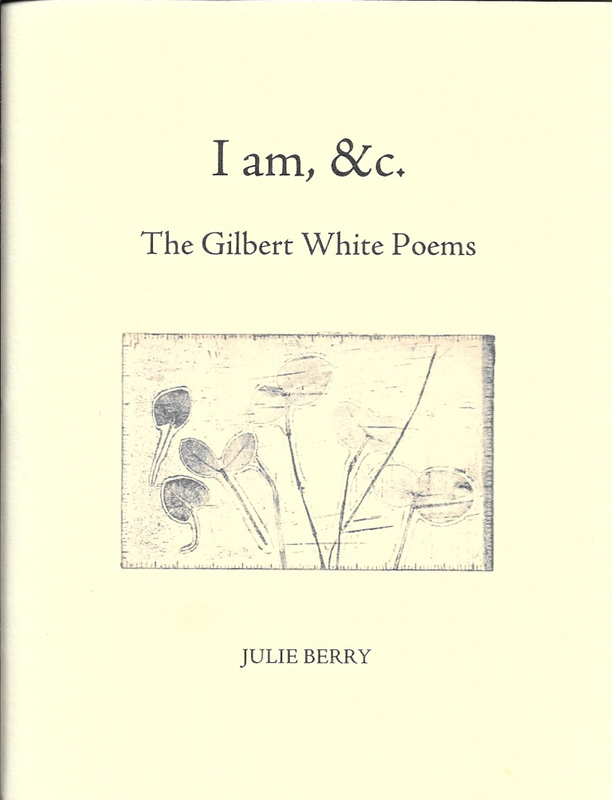 The first is a book of poetry by the Canadian Julie Berry. The poems are based on the diaries of Gilbert White who was the local parson but also a very keen gardener and naturalist. The little book is beautifully produced. The cover is of soft paper and made of St Armand Canal paper for which the makers use “fibers left from clothing industry offcuts, white tee-shirts, blue denim and flax straw from farmers”. The book cover has a lovely soft feel to it. At each end of the book, there is a flyleaf which is made of Thai Tamarind paper which is tissue like. 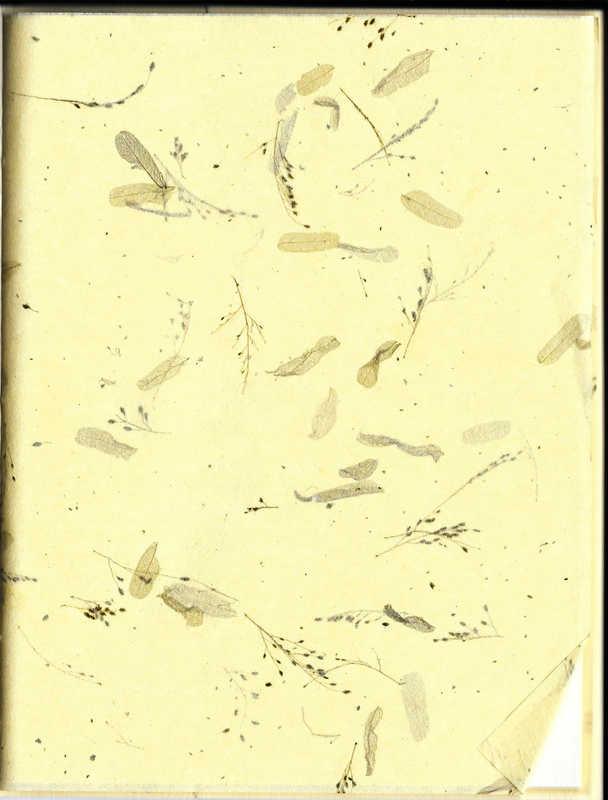 As you see in the photo below, this delicate paper contains dried (and dyed) tamarind leaves and bits of grass which makes it very attractive. This small, 24 page book is an artwork in itself. Along with this beautifully produced book was this. The packet of seeds is inside this creamy coloured and very attractive wrapping. 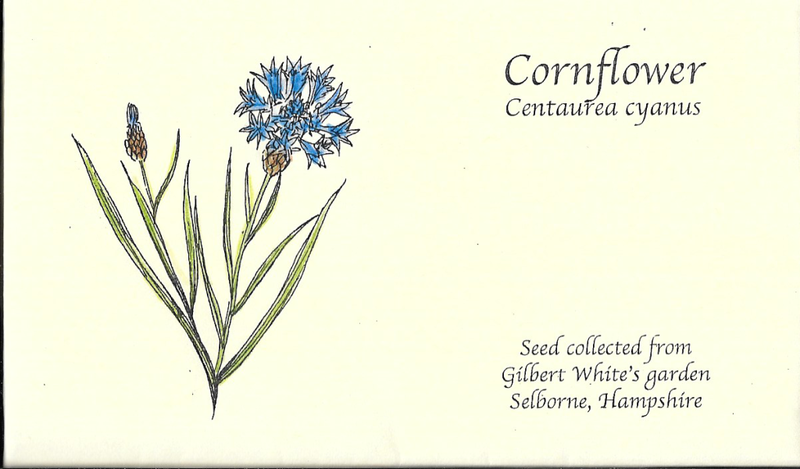 I will sow the seeds in the Spring and get an eye-catching display of what the packaging tells me will be “Dark blue flowerheads born from late Spring to Early summer”. I like the use of the word “born” here. I am still working my way slowly through Denise Riley’s remarkable book Say Something Back. There is a five-part poem in the book entitled The patient who had no insides and this relates to the author’s illness and hospitalization – not a subject which you think might be expressed poetically, but Riley does this with aplomb. Part of the poem shows her acquired knowledge of terminology which all hospitalised patients pick up, due to repetition by clinicians. For example “Enzymes digesting tissue grind/ In rampant amylase and swollen lipase counts” send the reader to the dictionary but to patients suffering from liver disease, these are everyday words. Riley’s description of parts of our insides are both graphic and imaginative. The liver is “A plush nursery for the vegetal spirit”. The spleen is “sole-like” and “roughened, its shoe-shape/ Splayed into an ox tongue”. The poem also covers the potential thoughts of doctors about the disease they treat. The patient is released from hospital even though “Your liver tests are squiffy Mrs R..”. Once outside, the patient reflects “A smack of post-ward colour shoves us back to life”. This is a very impressive book of poetry which covers topics which can be unsettling for the reader, but you cannot help being full of admiration for Ms Riley’s poetic talents. Still another 20+ poems to read. 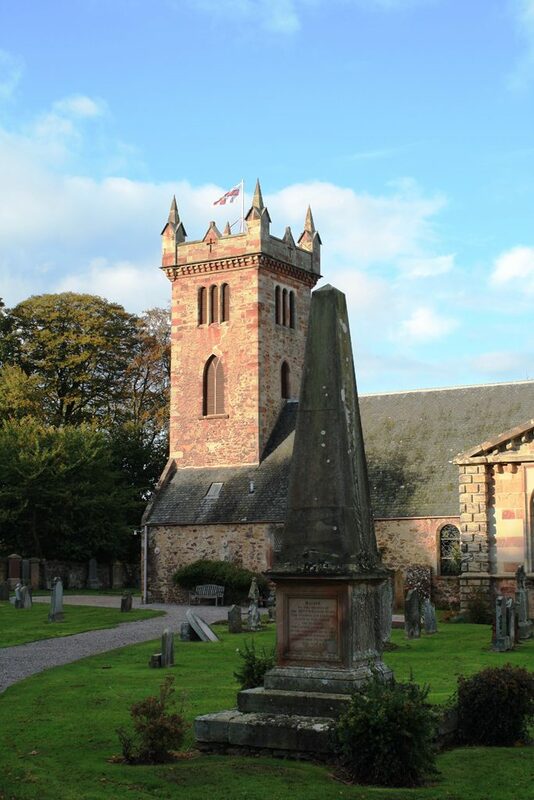 A recent walk in the attractive village of Dirleton which is up the coast from Dunbar, took us around the village green, past the impressive Dirleton Castle (good photos) and on to the local church yard. In Scotland, a Presbyterian church is called a kirk which originates from the Old Norse kirkja or the Old English cirice. The word kirk was used – I assume – after the Reformation to distinguish these Protestant churches from their Catholic counterparts, called chapels. When you turn the corner to see the kirk, it is the tower that first catches your eye. On the day we visited, the RNLI flag was flying. There’s an extensive graveyard with many old headstones, some of which tell the occupations of the people buried there. As with all churchyards, the people seen to be the most important – usually the wealthiest – in the area, got the biggest headstones. There are 3 books on the headstones available. 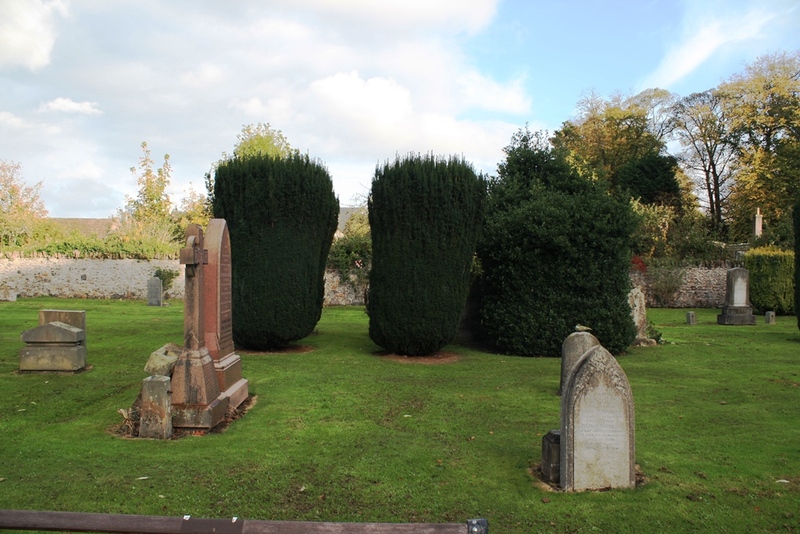 One of the most attractive features for me in the kirkyard is the presence of well coiffured yew trees (see below) whose proper name is Taxus Baccata, probably derived from the Greek for bow and the Latin for berry. The yew trees have the look of green headstones and perhaps, if you knew where to look, there might be a secret inscription inside. 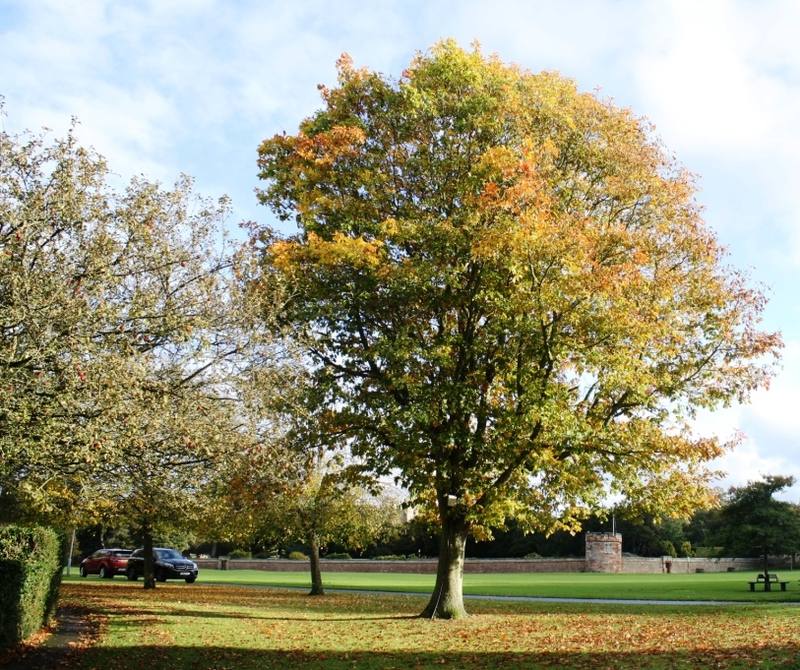 As you walk from the kirk back to the village green, you get a superb view of the village trees, the wide open green and the castle walls in the background. 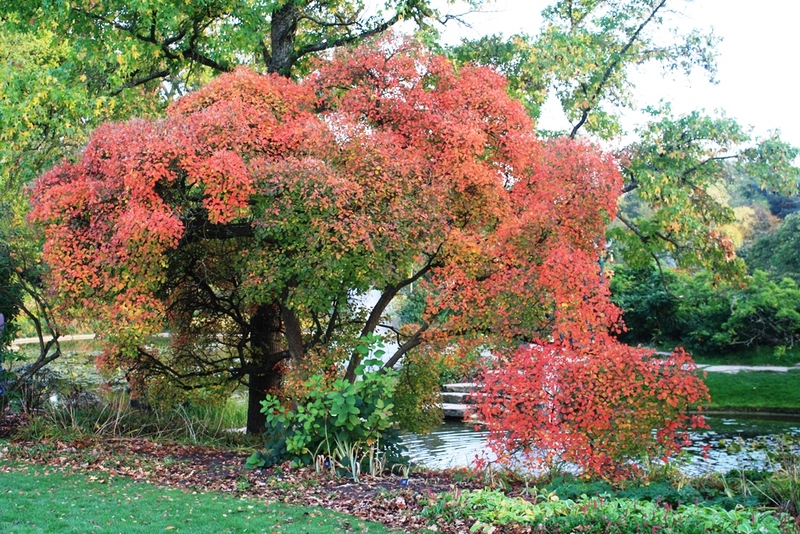 This view (photo below) was greatly enhanced on our visit by the magnificent tree with its autumn finery on display and its random scattering of leaves the ground adding to the colourful scene. 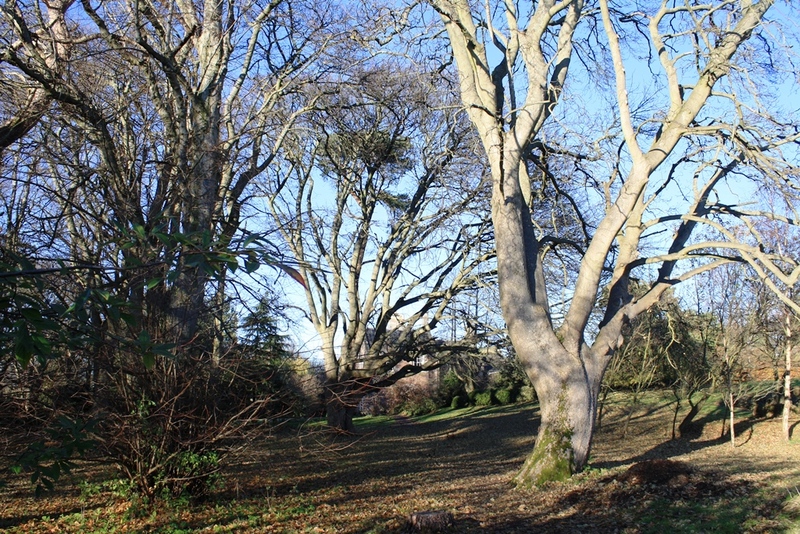 We’ve had very strong NW winds this weekend in East Lothian, so it’s likely that this tree will now be fairly bare, but the elegance of its structure and branches will remain. We have a new sculpture here in Dunbar. 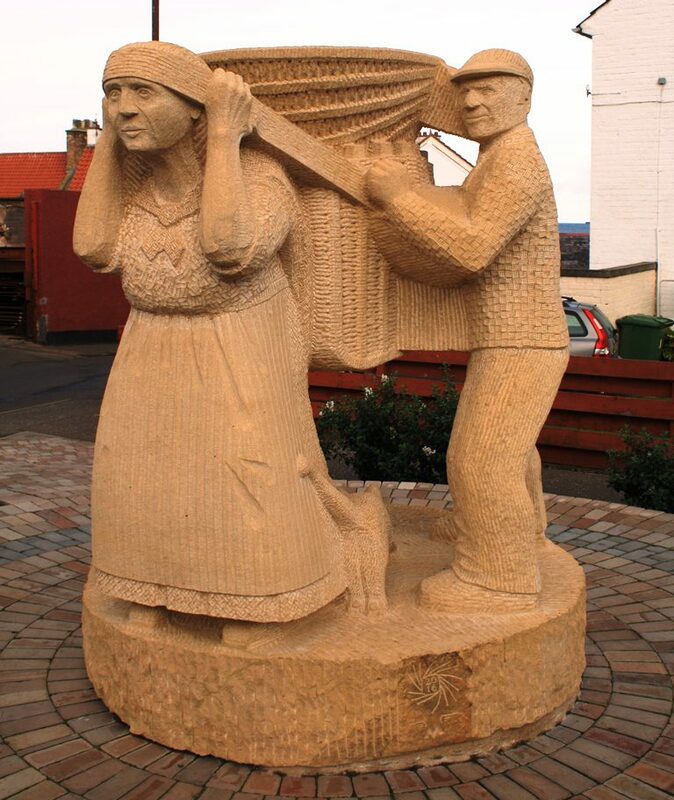 The Creel Loaders (photos below) is the work of sculptor Gardner Molloy who has done a number of public sculptures in East Lothian. This work sits at the junction of Victoria Street (on right in photo below) and Castle Gate. This is very near the harbour and the sea can be seen in the middle left. Gardner Molloy writes “My carving style is vigorous, simple and strong and I relish the use of textural tool finishes to provide contrast. I feel that neat chisel marks enhance the finished surface”. The words “vigorous, simple and strong” could be applied to the Creel Loaders on first looking at this very impressive piece of sculpture, but there is a complexity to work that emerges on closer examination. 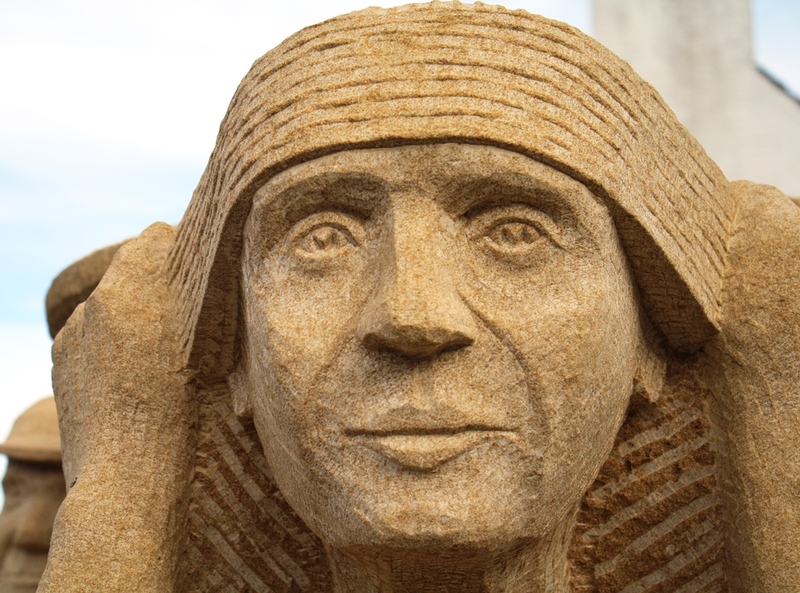 The woman’s head, which reminded me of an Egyptian goddess, is delicately carved and there is a determined (and maybe resigned) look on the woman’s face. 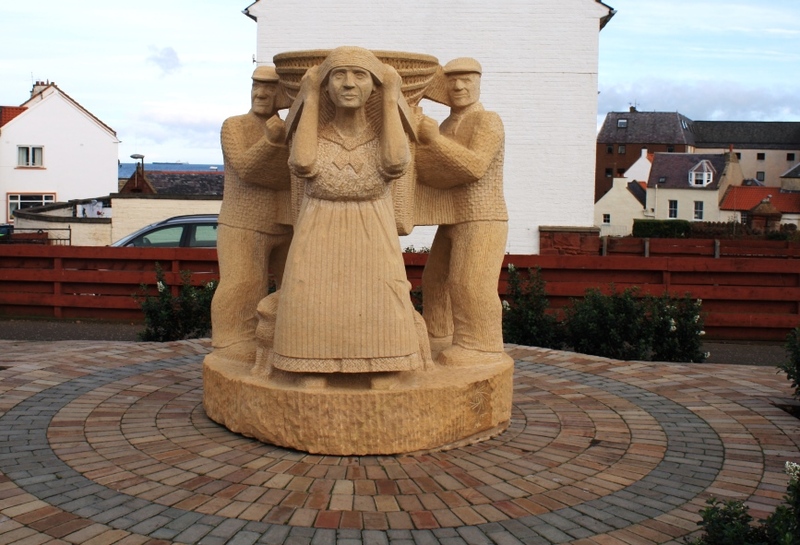 The sculpture was built to remember the harbour women of Dunbar who put a wicker creel/basket on their backs and waited while two men loaded the creel with fish – herring in particular in the early 20th century. The women then walked many miles into the countryside along the Herring Road (good photos) to sell their fish. This was backbreaking work and a perilous journey in the winter. What is often forgotten is that the women not only carried the fish as far as Lauder (33 miles/54K away) but they also often bartered their fish for fresh vegetables, which were in short supply in the poor harbour area, and carried the vegetables back home. This may account for the determined and resigned look on the woman’s face. Of course, there is more to this sculpture than a realistic representation of an historic event. In the photo below, you can see the elegant lines, flowing curves and intricate patterns in the bodies of the people (and the cat), in the woman’s headband and in the wicker creel. There is much to admire in this superb addition to Dunbar’s public art works and repeated visits will, I’m sure, reveal even more complexity in the work.